From Award Winning Screenwriter and Author Emmanuel C. Ezike II comes this tell all book which is now Free on Amazon. Written primarily to inspire and encourage, Ezike takes us through peaks and valleys of his life leaving the reader spellbound and utterly amazed and most importantly motivated in finding one's true passion and calling in life. 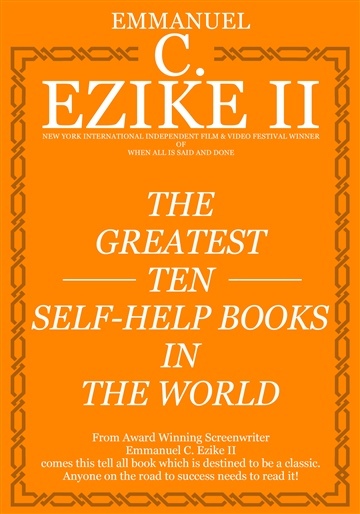 In this soon to be classic, Ezike dives right in and depicts detailed examples of how each one of The Greatest Ten Self-Help Books In The World affected and improved his life; starting with The Greatest Salesman In The World by Og Mandino all the way to Neville Goddard's Resurrection. Ezike writes with such poignant and dramatic precision that one is left inspired and simultaneously entertained. The Greatest Ten Self-Help Books In The World proves to be at par with some of the self-help classics of our times; and Ezike could and if not be one of our modern day Philosophers and Thinkers. His life chronicles periods of deep frustration, challenge and ultimate success that is common amongst many high achievers. A writer for our times, he is poised to say much more of what this era needs to showcase how one can come from the bottom and edge their way to the top. The Greatest Ten Self-Help Books In The World is a book you will definitely want to keep close to your heart!